You don't have to wait until Valentine's Day either to make this decadent mac & cheese recipe. It's both elegant and comforting... perfect for a special night in, anytime of year. I lucked out getting a good deal on lobster that even though I wanted to wait to make this, I have no regrets making it earlier than planned. The recipe comes from my favorite gal, Ina Garten. This mac & cheese recipe uses 2 cheeses - extra sharp cheddar and Gruyere. Both go exceptionally well together, even moreso with lobster. If you can't get your hands on lobster, don't fret! You can substitute it with lump crab meat too. 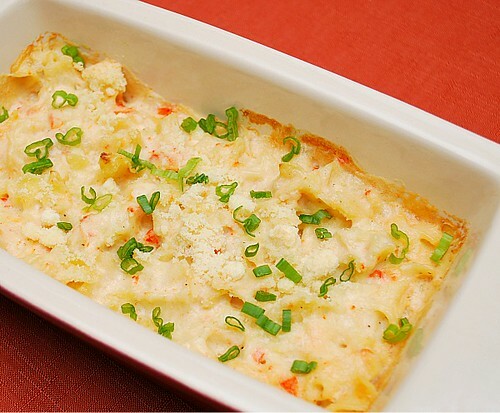 The original recipe called for baking in individual gratin dishes but you can also bake this in a large baking dish too. Meanwhile, heat the milk in a small saucepan, but don't boil it. In a large pot, melt 6 tablespoons of butter and add the flour. Cook over low heat for 2 minutes, stirring with a whisk. Still whisking, add the hot milk and cook for a minute or two more, until thickened and smooth. Off the heat, add the Gruyere, Cheddar, 1 tablespoon salt, the pepper, and nutmeg. Add the cooked macaroni and lobster and stir well. Place the mixture in a large baking dish or 6 to 8 individual gratin dishes. Melt the remaining 2 tablespoons of butter, combine them with the fresh bread crumbs, and sprinkle on the top. Bake for 30 to 35 minutes, or until the sauce is bubbly and the pasta is browned on the top. Garnish with sliced green onions and serve hot. I love the combination of something so common with a food as elegant as lobster. Mmm sounds delicious. Last night I made shrimp mac and cheese. I'd loove lobster mac and cheese! I made this last Valentine's Day for my husband. It was excellent and just the right combo of elegant and comfort food!